Greek food, wine and spirits are featured at cozy West Village restaurant Voula. The menu offers mezedes (shareable appetizers) and paradosiaka (traditional plates), like a trio of taramosalata, melitzanosalata and tzatziki, and pork loin cooked in parchment paper with tomatoes and feta. Dinner nightly. Voula, 9 Jones St., New York, NY 10014, 212-989-6500. Giuseppe Manco has brought his pizza expertise from Naples, Italy, to midtown. At Mani in Pasta, he serves Roman-style pizzas, salads, panini, pasta and gelato in this cafeteria-style spot. Mani in Pasta, 14 E. 37th St., New York, NY 10016, 646-870-5851. Kevin Chun, who is from Hawaii, oversees the kitchen at Harvey, an American restaurant with some Italian touches in The Williamsburg Hotel. His menu includes spaghetti squash cacio e pepe and pizza with harissa and roasted tomatoes. There’s also an afternoon tea and treats from Brooklyn Bread Lab. Harvey, The Williamsburg Hotel, 96 Wythe Ave., Brooklyn, NY 11249, 718-362-8100. La Mercerie restaurant in the furniture and design store Roman and Williams Guild in SoHo serves French food prepared by chef Marie-Aude Rose. The menu includes heart of rib-eye with mushroom butter and buckwheat crêpes. Furniture, kitchenware and dishes are also for sale. Open daily. La Mercerie, 53 Howard St., New York, NY 10013, 212-852-9097. From the son of the owner of the original Mama's pizzeria, this pizza restaurant also serves panini and fresh garlic rolls. Their house pie has fresh basil, bright tomato sauce, and a crispy crust. Lunch and dinner daily . Chef Rene Garcia combines the flavors of Latin America and Asia at ZenTaco, his Upper West Side taco shop. Rice bowls, noodles and poke, plus frozen margaritas and local beers, are also served. Lunch & Dinner daily. ZenTaco, 522 Columbus Ave., New York, NY 10024, 212-787-3473. The La Contenta group's new West Village location, La Contenta Oeste, serves breakfast, lunch and dinner until 4 a.m. The Mexican menu features dishes like queso fundido, ceviche, and chicken in mole sauce with plantains. Breakfast, Lunch & Dinner daily. La Contenta Oeste, 78 W. 11th St., New York, NY 10011, 212-533-2233. Gramercy Kitchen on Third Avenue serves American classics for breakfast, lunch and dinner at no-frills tables and a counter. The menu ranges from steak and eggs and banana nut pancakes to a burger topped with avocado and a Cuban Reuben, and selections under the heading “Diner Roots” like chicken and waffle and a tuna melt. Breakfast, Lunch & Dinner daily. Gramercy Kitchen, 184 3rd Ave., New York, NY 10003, 917-265-8884. Pheasant on Graham Avenue in Brooklyn offers Mediterranean cuisine in an airy room full of succulents. Chef Vincent Fraissange’s menu features dishes like whole grains with wilted greens, baby beets and a panko-covered egg, and a hanger steak with Parmesan jus and brown butter pomme purée. Pheasant, 445 Graham Ave., Brooklyn, NY 11211, 718-675-5588. Som Bo, from owners Robert Chan, Russell Yam and Kitty Tsang, specializes in Asian-inspired grain bowls. In Cantonese, som bo means "three treasures," here referencing grains, proteins and vegetables. Lunch & Dinner daily. Som Bo, 143 8th Ave., New York, NY 10011, 917-261-7947. Sal Basille and Francis Garcia, the team behind Artichoke Basille’s pizzeria, have opened Frankie Portugal, a Meatpacking District café serving Portuguese coffee, rolls, pastries and flan. Breakfast & Lunch daily. Frankie Portugal, 457 W. 17th St., New York, NY 10011, 212-792-9200. Shinka Ramen & Sake Bar in the 18-story Wyndham Garden Chinatown serves bone marrow bao, dim sum and yuzu-infused saké. Ramen, however, is the star of the show. Dinner nightly. Shinka Ramen & Sake Bar, Wyndham Garden Chinatown, 93 Bowery, New York, NY 10002, 212-343-8111. St Tropez Wine Bar in the West Village takes its inspiration from the south of France. Choose from menu selections such as cheese and charcuterie plates, mushroom risotto and tomatoes stuffed with ground beef, a Provençal specialty. Lunch & Dinner daily. St Tropez Wine Bar, 304 W. 4th St., New York, NY 10014, 917-388-3893. After a pop-up in Times Square, Kellogg's has opened a permanent café on Union Square. Kellogg's NYC is a social-media friendly spot featuring an open kitchen and an area for kids, plus 10 self-service cereal varieties, milkshakes and pop-tarts. Breakfast & Lunch daily. Kellogg's NYC, 31 E. 17th St., New York, NY 10003, no phone. Negril BK is a 200-seat restaurant serving Caribbean food by chef Kingsley John, a native of St. Lucia. The menu includes jerk lamb meatballs and seafood stew with grits. A Rum Shop mixes cocktails late into the night. Negril BK, 256 5th Ave., Brooklyn, NY 11215, 347-721-3801. From the owners of Hecho en Dumbo, La Loncheria serves Mexican fare like tortas and tacos, plus salads, grilled octopus and a burger. Cocktails feature agave-based spirits and rum. La Loncheria, 41 Wilson Ave., Brooklyn, NY 11237, 212-729-4235. Peter Yi, the man behind PJ Wine in Inwood, has launched Brooklyn Cider House, a cider house, bar and restaurant in Bushwick that will showcase the ciders he crafts from his Hudson Valley orchard. The ciders and menu are inspired by Yi's travels through Basque Spain. Brooklyn Cider House, 1100 Flushing Ave., Brooklyn, NY 11237, 347-295-0308. Il Laboratorio del Gelato, the Lower East Side gelato lab, has a new location in Greenwich Village, which offers gelato sandwiches and ice cream cakes plus 48 rotating flavors of gelato. Open daily. Il Laboratorio del Gelato, 56 University Place, New York, NY 10003, 212-343-9922. Donner and Blitzen's Reindeer Lounge is a holiday pop-up decked out with twinkly lights, fireplaces, pretty Instagram-worthy spaces and a "Reindeer Playing Poker" mural. On the menu, look for beer and wine and fancy grilled cheese. Lunch Sat.-Sun., Dinner nightly. Donner and Blitzen's Reindeer Lounge, 197 E. 3rd St., New York, NY 10009, 212-254-9184. Henry at Life Hotel, the restaurant from Stephen Hanson (BR Guest) at the midtown boutique Life Hotel, serves the cuisine by chef Michael Vignola. The menu includes dishes like cauliflower and grapefruit salad and dry-aged beef tartare with malt chips. Dinner nightly. 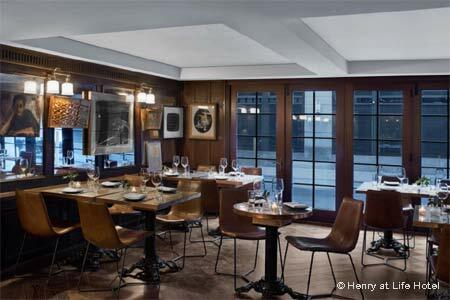 Henry at Life Hotel, Life Hotel, 19 W. 31st St., New York, NY 10001, 212-615-9910. China's beloved chef Dong Zhenxiang has opened DaDong, his first restaurant in the U.S. The place specializes in roast Peking duck. Other dishes, like sticky rice wrapped with Iberico ham, take their inspiration from cuisines found around the world. Lunch Mon.-Sat., Dinner nightly. DaDong, 3 Bryant Park, New York, NY 10036, 212-355-9600. Chef PJ Calapa, an Altamarea Group alum, has opened Scampi, a Flatiron restaurant where scampi takes center stage, such as a version with grilled head-on Scottish langoustines. The menu includes plenty of other seafood, too, from razor clams to swordfish. The wine list focuses on southern Italian options priced under $60. Scampi, 30 W. 18th St., New York, NY 10011, 212-888-2171. Fausto serves Italian dishes such as braised pork shank with white beans and gremolata and whole-wheat bigoli with duck ragù. Italian wine is a focus. Sommelier Joe Campanale and chef Erin Shambura revamped the former Franny's space with a marble bar and Venetian-plastered walls. Dinner nightly. Fausto, 348 Flatbush Ave., Brooklyn, NY 11238, 917-909-1427. SPK Hospitality and Ryman Hospitality Properties, the group behind the Grand Ole Opry in Nashville, have opened Opry City Stage, a NYC spinoff of the historic Tennessee country music spot Grand Ole Opry. The four-story venue near Times Square includes a retail shop, a bar, multiple stages and a 260-seat restaurant, which serves Southern-inspired eats like hot chicken with waffles. Dinner nightly. Opry City Stage, 1604 Broadway, New York, NY 10019, 212-388-5565. Beloved Queens Thai restaurant Sripraphai now has an outpost in Williamsburg. Chef Sripraphai Tipmanee presides over the 100-seat venue, which serves larb, noodles, soups and curries along with Isan sour sausage and mango sticky rice. Lunch & Dinner daily. Sripraphai, 176 N. 9th St., Brooklyn, NY 11211, no phone. Gino Sorbillo's family has been making and selling pizza in Naples since 1935. Sorbillo, their pizzeria on the Bowery, turns out big pies with light, chewy crusts. Gnocchi with fresh mozzarella and tomatoes and meatballs with garlic and parsley are also on the menu. Lunch & Dinner daily. Sorbillo, 334 Bowery, New York, NY 10012, 646-476-8049. Juku in Chinatown offers izakaya-like fare on its ground floor: tonkatsu and chicken teriyaki along with cocktails. Upstairs, chef Kazuo Yoshida (Williamsburg's 1 OR 8) runs a 12-seat sushi bar that specializes in omakase. Juku, 32 Mulberry St., New York, NY 10013, 646-590-2111. Baar Baar, chef Sujan Sarkar’s Indian gastro bar, serves classic dishes and those prepared with avant-garde flavors and techniques. The menu features Kashmiri-style lamb ribs as well as potato and bone marrow kulcha. Creative cocktails are available, too. Baar Baar, 13 E. 1st St., New York, NY 10003, 212-228-1200. The Rag Trader pays homage to the old garment factory and office that it now occupies. Raw bar selections, wood-oven pizzas and small plates, along with craft cocktails and local beers, are on offer at this Midtown West spot. Dinner nightly. The Rag Trader, 70 W. 36th St., New York, NY 10018, 917-261-5495. Joe Carroll (St. Anselm) shuttered Semilla to open Casino Clam Bar, which reimagines a seaside clam shack in Brooklyn. The spot serves littlenecks on the half shell, uni with house-made tagliatelle and white clam pizza with stracciatella. Dinner nightly. Casino Clam Bar, 160 Havemeyer St., Brooklyn, NY 11211, 718-782-3474.